“Climate Change Denier” is a derogatory term, used against those who are skeptical about changes in global climate having been caused by human industrial activity. The term is, however, used to imply that such skeptics deliberately deny obvious facts about changes in climate. This is not so. Changes in climate are observable, repeatable science. The skeptics merely dispute the scare-mongering corollaries drawn by climate change alarmists, and they also dispute the idea that such changes are caused principally by human activity. But if there are changes in climate, and they are not caused by human activity, then what are they caused by? Natural explanations are more likely because it is clear that global average temperatures have changed before, such as during the Medieval Warming Period and the Little Ice Age. One explanation has been suggested by a team led by Dr. Henrik Svensmark. Svensmark has noted for several years the connection between sunspot activity and temperature. Periods of lower sunspot activity coincide with colder temperatures. The latter half of the 20th Century, for example, was notable for high sunspot activity. 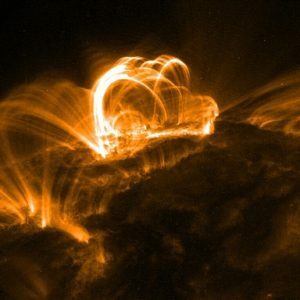 Such high activity is associated with magnetic bursts of energy from the sun, preventing cosmic rays reaching the Earth, and hence preventing the cooling effect of these rays. Climate change, like evolution, has become a mythology of our time. All such issues should be examined, using the solid starting point of Scripture on which to base all our scientific interpretations. Prayer: Help us, Father, not to be led astray needlessly by winds of change, but to anchor ourselves firmly in the foundation of Your word. Amen. Ref: < http://www.telegraph.co.uk/science/2017/12/19/exploding-stars-influencing-weather-scientists-find/ >, accessed 12/26/2017. Image: Public Domain (NASA).